The Philadelphia Eagles faced some big challenges last season. After struggling for most of the year offensively, frustration reached its peak in Week 12 when quarterback Donovan McNabb was benched due to multiple interceptions as the Eagles were sitting at a record of 5-5-1. However, Philadelphia stormed back the following week in their best offensive performance of the season, posting 48 points against the Cardinals. The benching of McNabb had sparked the Eagles as they rallied back to win four of their last five games to make the playoffs. Backed by one of the best defenses in the conference, the Eagles momentum carried over into the playoffs with wins over Minnesota and New York. However, in the end the Eagles fell one game shy of an NFC Championship for the fourth time in the last eight years. The strength of the Eagles last year came from the defensive side of the ball. Philadelphia ranked third overall, but that was better than any other team in the NFC. The Eagles ranked in the Top 5 in every major defensive category and they possessed the league’s fourth-ranked scoring defense, holding opponents to just 18.1 points per game. The Eagles dynamic defense flourished when they needed it most, holding teams to just 12.2 points per game in the last seven games of the season including the playoff victories before faltering to the explosive Arizona offense in the NFC Championship Game. The Eagles defense should be at the forefront of the team’s success again this season. However, the Eagles will have to do it without long-time Defensive Coordinator Jim Johnson who passed away in late July after a long fight with cancer. Hopefully, new DC Sean McDermott can continue the tradition of the Eagles having one of the top defenses in the league every year. The Eagles passing attack surged during the latter part of the season. The Eagles rushing offense was predicted to be the strong point of the team. However, Brian Westbrook failed to reach the 1,000-yard plateau on the ground for the first time since 2005. Although the running game ranked towards the bottom in the league, McNabb was able to throw for just less than 4,000 yards and 23 touchdowns on the season. The passing game could see more improvements this season. DeSean Jackson caught 62 passes for 912 yards last year in his rookie campaign. He is expected to have a breakout season. Also, the addition of Jeremy Maclin will put another dangerous young talent on the field. Maclin, who is a former standout at Missouri, should find playing time towards the midway point of the season. Philadelphia will also put more focus on the ground this season. The additions of both LeSean McCoy and Leonard Weaver should help matters. Weaver is one of the best young fullbacks in the league and may even get some attention at the tight end position. Weaver was signed to a one-year deal from Seattle after the Seahawks failed to re sign him and he should help pave some holes for the tailbacks. LeSean McCoy is the former Pittsburgh standout drafted by the Eagles in the second round of the NFL Draft. McCoy will get the handoffs when Westbrook is off the field and also keep your eyes on McCoy as he has surprising speed to catch passes out of the backfield. All these factors combined should make the backfield much more dangerous this coming season. 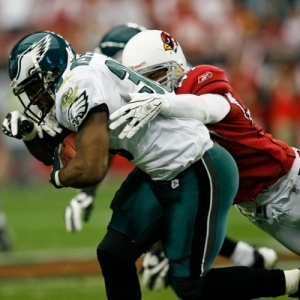 2009-10 Philadelphia Eagles Predictions: Philadelphia should again have one of the top defenses in the league despite losing one of the best defensive coordinators in NFL history. The offense should also be on the upswing with the addition of so much young talent. The majority of NFL predictions will have the Eagles as a legitimate contender in the NFC. However, not only will the Eagles be a contender, but this should be the year they win the NFC. Expecting a regular season record of 11-5 which is well over the 9.5 O/U wins total, the Eagles should win both the NFC East and wrap it up with a trip to Super Bowl XLIV.